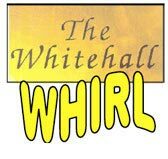 The Whitehall Whirl is a full-color, 8-page newsletter that is published seasonally under the auspices of the Whitehall Tenants Corp. The purpose of the newsletter is to keep all residents informed about important happenings at The Whitehall, including critical Board and Building Management decisions and policies affecting residents, features and stories about residents' special accomplishments, articles and profiles of staff members, announcements of new events scheduled at The Whitehall, etc. There are many buildings that issue periodic newsletters as one or two-sheet bulletins produced on a copier machine. We believe that there is nothing like The Whitehall Whirl, in terms of its size, scope, and depth of articles, use of photography and color, and professionally-printed and bound quality, in the Riverdale area, if not the entire city of New York.